When this song first came out, I had a friend call me up and ask if I’d heard it. “You’ll like the first two lines,” he said. I was in seminary at the time, and while this friend would be someone who would probably identify as skeptical, he would always come and hear me when I preached or taught. He knew my theology, my style, my leanings. He knew that I think that many people pray to a God that they don’t believe in. Perhaps he is one of them. Perhaps we all are at one time or another. We must remember that the opposite of faith is not doubt. The opposite of faith is certainty. Somewhere down the line of history we’ve lost sight of this, to the detriment of those of us who identify as religious and spiritual. When I was going through my first wrestling period with faith, I felt terrible. I felt as if I had been fed these lies that I was supposed to mentally assent to and that I was finally coming out of a deep hole…only to find the world around me disordered and frightening. It felt as if I was breaking a relationship with someone. It felt as if I couldn’t breathe. But I still attended services. I still attended church. I still contributed in religious discussions. I still prayed to a God that I didn’t believe in. And those practices brought me back around to faith. Those practices, and some meaningful discussions with people who took faith seriously enough to fight with it, brought me back around to a space in this world where I could once again interact with God. But it wasn’t belief, per se. It was much more powerful than belief. This is why, when Rick Warren the pastor of the mega-church Saddleback Church and author of The Purpose Driven Life, writes in an article published early last year that “change always starts in the mind,” and “to help people change, we must change their beliefs,” I think he’s ridiculously lost in the post-enlightenment mindset that has led the church to this place where people are leaving in droves. Take out the God wording in that sentence, and I think it exposes what they’re really saying. I don’t want to invite people to believe in God. I want to invite people to trust in God. We can believe all sorts of things about God, about God’s nature, about God’s action in the world. We can believe all sorts of things about God’s authority, about what God expects of us. But if “belief” is equal to “mental assent,” then everything rests on whether or not I believe what you believe about God. If not, we end up fighting or not talking. But if we trust God, we can trust enough to ask questions about God, of God, of one another without being threatened. And then trust enough to invite people into those questions as well. 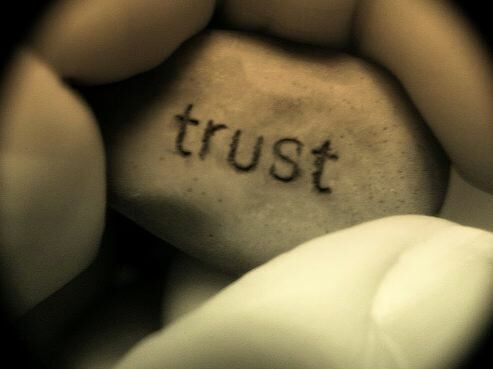 And trust is, I think, indicated through activities and practices. I think that as we head into this next phase as people of faith, practices…activities of trust…will become more and more important. I’m not sure how to invite Jesus into my heart, or even what that phrase means. But I strive to live as if God is already present inside of me. And you, too. And in the stranger, regardless of what they believe. And I find it important to gather with other people who trust in that way, too. Or who want to trust. Or who don’t trust but think it’d be interesting to see what it looks like. We teach one another. And as someone who has been there in the deep hole of not making sense of whats up or down because not everything that you’ve been taught to believe lines up with reality, it’s really important, when you find yourself barely breathing, to pray to God…even if you don’t believe. Doing so you’re embodying something more powerful than belief. You’re trusting. And trusting can change things. This entry was posted in Rite and Rituals and tagged Atheism, Belief, Grace by Timothy Brown. Bookmark the permalink. I think that astounding differences in conversation can come from a change in language. Imagine “I trust in God the Father almighty Creator of Heaven and Earth” It goes from the mental affirmation of absolute and changes it to a emotional/spiritual experience of trust. It’s making the conscious decision to say I may not have all the answers, but I put my trust in something I can’t understand. Believe leaves little room for growth its either Yes or No. Trust says I have the choice of doubt but it cannot overwhelm what I have come to know or what I am willing to take a chance on. Doubt should always be present it’s just whether or not we feed doubt to the point of exclusion or use doubt to allow our trust to grow. Der zweifel ist nicht das gegenteil doch ein element des glaubens. Doubt is not contrary to but rather an element of faith. I find this to be rather useful. The Creeds are a rock, they are our catholic tradition, like our liturgy, and the Confessions. Looking at the Creed through the Chatechism washes our relationship with God in fear, love and trust even as we doubt. I think there is another issue in the post though, and that is the idea of works righteousness. It is important to have faith, to trust in God’s promise even as we doubt, because without the grace that comes from that any good works are simply dirty rags. As far as lex orandi, lex credendi concerns Lutherans, I do think this is a useful tool when discussing liturgical practice, but Lutherans are confessional, whereas Anglicans are not. Lex orandi, lex credendi is as close as they get to a confession through their Book of Common Prayer. I fear that I’ve started addressing things that would better be taken up with our host, so please forgive me if I’ve gone off the rails. I don’t disagree with you and my purpose wasn’t to say change the creeds. It was simply an example of a change in word or even understanding of the word could bring about discussion rather than cut it off. I most definitely should be the one rewriting creeds. I think it may be a problem of proper catechesis. I’m not sure that confirmands, or anyone is truly being taught the Catechism. Many of the questions of belief and trust may be answered in the confessions of the church. What is meant by this Article? I believe that God has created me and all that exists; that He has given and still preserves to me my body and soul, with all my limbs and senses, my reason and all the faculties of my mind, together with my raiment, food, home and family, and all my property: that He daily provides me abundantly with all the necessaries of life, protects me from all danger, and preserves me and guards me against all evil; all which He does out of pure, paternal and divine goodness and mercy, without any merit or worthiness in me; for all which I am in duty bound to thank, praise, serve and obey Him. This is most certainly true. I BELIEVE IN, that is, I trust in, I rely upon. ALMIGHTY, He is able to do all things, and to help me in every time of need. I do think that if this was still being taught today the doubts that people have would be realized as a part of faith rather than its opposite. Thank you for so clearly articulating the problems with “beliefs.”. I have long struggled with some Christian beliefs, but have come to appreciate the importance of having faith in the power of Christian spiritual practices. You have given me some new ways to think about my experience. I came to this same understanding, almost word for word, a few years ago, because of something that was said during my niece’s baptism. It was a huge “light bulb” moment for me and something I am forever thankful for. However, I do still have a question: how do you place your trust in something you’re not even sure is there? Hey Laura, Thanks for the comment and question. I must be absolutely clear about the fact that I don’t disbelieve God’s existence anymore. What I’m trying to point out here is that believing things about God and trusting God are two different activities, and for me to believe in God’s existence again, I had to first trust God. An unusual path, but true. I was wanting to reply to your comments, but really didn’t know what to say. I think some of the things I’ve said above may apply, but then I was looking on another web-site and found an article that may be helpful. Just one word of warning. the site to which I’m sending you is a terribly conservitive site. I do not reccoment it in general, but feel that the spesific article to which I send you may be helpful. I like to think of it from the perspective of something like parachuting. When someone goes for the first time and steps out of that plane into nothing, they are placing their trust in the chute. The terror felt before stepping out (or being pushed out) is doubt and a general lack of belief that the chute is actually there and will work. The jump is made without belief but with absolute trust. Hmm… and there is a notable lack of skydiving in my background… However, I notice that, had I ever engaged in such an activity, my trust would have been placed in something I could point to: the parachute, the instructor, the pilot, the person who packed the chute, my crazy friend who somehow talked me into it, etc. It’s different with God, at least for me. Harder. But I keep wondering and thinking. Erich, thanks so much for your generous caring and consideration. I am especially struck by your concern that you were sending me to a “terribly conservative” site. It’s okay, I’m able to think for myself and can usually learn something even from those I might disagree with, so, conservative, liberal, or in between, it’s okay. I did read the article your link brought me to, and I think I see the point there, but I’m afraid it doesn’t answer my question. But that’s okay, too. I’m used to being unsure and confused about religious ideas. Mostly I just want to thank you for your kindness. Are you sure that’s true? If Paul’s writings are a guide to the standards of the early church at all, parts like 1 Cor 15 not only insist on certain doctrine (v. 1-8, 12-13), in this case about resurrection, but tie belief in them to spiritual outcomes (v. 32-34). There are a whole bunch of warnings about false teachers/doctrines from Paul (you would know the exact verses better than I) all suggesting that “beliefs” – in the sense of “doctrine” rather than (or additional to) “trust” – are important. Hey Nerdiah, I think you’ll have to take that question up with Dr. Butler-Bass, but I do think she’s correct here. In fact, the early church was not at all homogeneous in it’s doctrinal subscription, as the letters you mention actually show. Paul does warn about some of the logical (or spiritual?) consequences of subscribing to such doctrine, but even Paul himself prescribes different doctrine for different circumstances. That being said, I still contend that the Biblical use of “belief” is not the same as mental assent, and that should be noted. So even doctrine itself wasn’t meant to be believed, but to be lived. It’s quite different from today’s use of the term. Oh I didn’t know that, or do you mean like with the issue of circumcision? It’s not quite “doctrine” though, which issues of doctrine did Paul allow flexibility on? Well, I think circumcision as practice has an underlying doctrine behind it: covenant. I think it could be argued the circumcision is doctrinal in nature. But more than that, I think it is clear that Paul has a Christo-centric faith system. In that there is no flexibility. But it has been argued, and I think convincingly, that Paul’s advice changed from community to community based on the particular circumstances/needs of the community. That advice has doctrinal foundations. I think these contradictions can be seen in 1 Timothy where calls for women to be silent, but yet praising Phoebe in Romans as “sister and deacon.” The underlying doctrine has to do with the “order of creation” (1 Timothy 2:13). Some may draw a distinction between the Greek origin of “deacon” and “teacher,” therefore saving Paul from contradiction, but I think that would be splitting hairs. Yes, I think I see what you’re saying. The original distinction you’d made was between “belief” versus “trust”, an intellectual asset versus an attitude of faith manifest in activities and practices … It seems everything straddles both; circumcision is an activity manifesting trust in the covenant, though what one believes intellectually about the rules of that covenant determine which practices manifest the faith. When I was looking for my example I also found 1 Tim 1:3-7. I think it’s interesting what some of Paul’s justifications are for ignoring false doctrines and talk about “myths” and “endless geneologies”. He characterises it as “meaningless talk”, and says they “promote controversies rather than God’s work – which is by faith. The goal of this command is love…” That meshes with what you’re saying, that the trust and the work come first, and what one specifically believes about the details are secondary (or even counter-productive) to that. I wish I knew what “myths” he was referring to. Titus 1:13-14 identifies “Jewish myths” but that doesn’t narrow it down for me; do you know? I suppose there are doctrines and then there are doctrines. 1 Tim 1:15 says that the doctrine that Jesus came to save sinners is characterised as one “trustworthy and deserving of full acceptance”. But isn’t that an intellectual belief as well? One may accept or reject it on the basis of logic and rationality, such as by analysing the various gospel regarding the empty tomb. How does one trust that Jesus came to save sinners if the intellect isn’t agreeing? How do you personally do it? Thanks, I didn’t know about that one. I got a bit confused halfway through my reading. Don’t you have to believe something exists before you can trust it? If you don’t believe in God how then can you trust him?